Child Kit (one 8oz Worm Out), Small Adult Kit (two 8oz bottles of Worm Out), or Adult Kit (one 32oz bottle of Worm Out). They each come with 1 bottle of Garlic Capsules (100 Capsules) and 1 bottle of the NOW Gr8-Dophilus probiotics (60 Vcaps). Make sure to select the proper size kit for your needs. 1 - WEAKEN or neutralize parasites so they will release their hold in the body. We recommend using raw garlic and/or Garlic Capsules (3 daily with meals). This step usually takes a good week to 10 days before moving to the next step. Eat cleansing foods to get or keep the bowels moving. 2 - FLUSH parasites and their toxins from the body with our Worm Out formula. Begin with 10 days on, then 10 days off, then 10 days on again. Suggested Use: 1/2 teaspoon (per 25 lbs. body weight) straight or in water every 3 hours for at least 3 times per day. 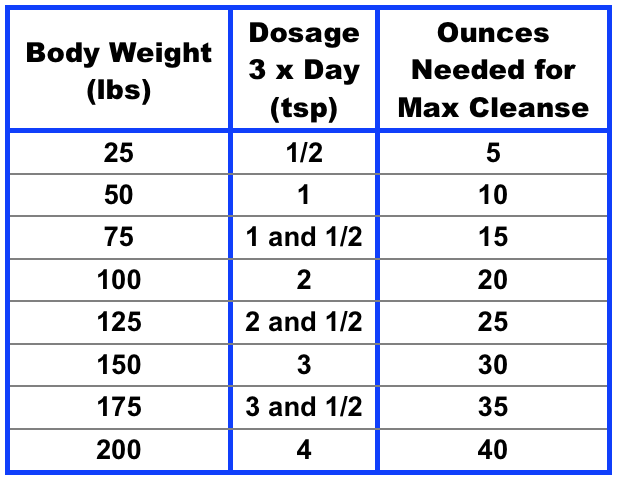 For maximum results, it is important to have enough Worm Out for the entire cleanse (See dosage chart to determine how much you will need). Continue to drink enough water and eat cleansing foods to keep the bowels moving. Cleansing the colon at this time is imperative to prevent the body from becoming overloaded with toxins from parasite die-off. 3 - STRENGTHEN and balance body organs and systems with a variety of whole foods, nutrients and probiotics. We recommend using NOW Gr8-Dophilus Probiotics. Herbs that help cleanse the blood are also recommended. This step is important after flushing with Worm Out and helps prevent re-infestation. * EAT LIGHTLY – Choose more veggies, salads, leafy greens and cleansing foods, including pumpkin seeds and/or dried figs. Avoid high sugar fruit at this time. * ELIMINATE JUNK FOOD – Especially avoid sugary, greasy or refined food. * DRINK PLENTY OF WATER – Imperative to keep the system flushing out toxins. * BE PATIENT and PERSISTENT – Make sure you have enough Worm Out formula to stay with the cleanse until results occur or symptoms abate. Consult your Health Care Practitioner as necessary.